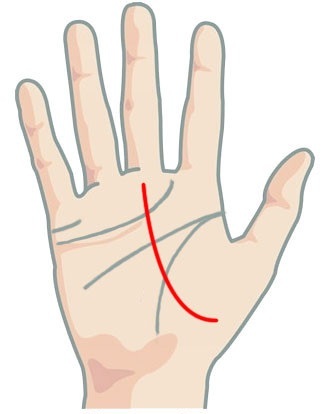 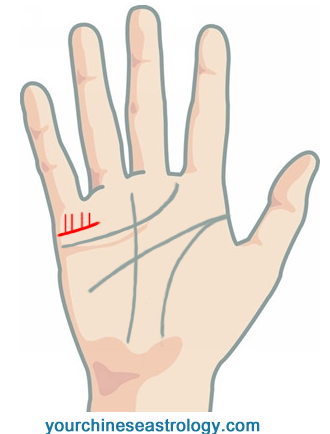 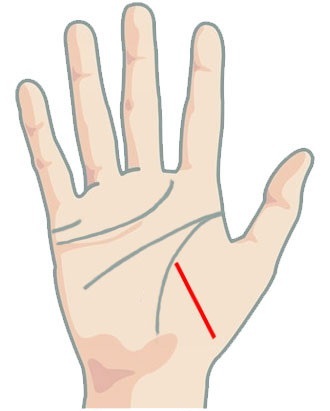 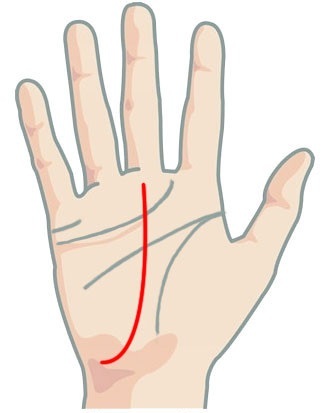 The fate line is one of the major palmistry lines on hands. 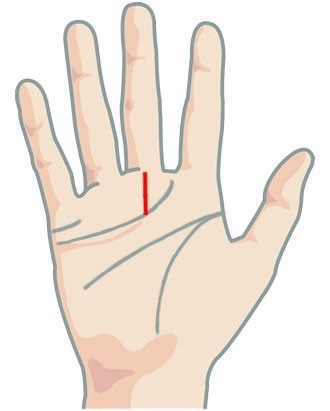 It is a vertival line running up the palm towards the base of the middle finger. The starting poin can be anywhere from the base of the palm (most of the people find it begins from the middle part). You can find its location from the right picture. 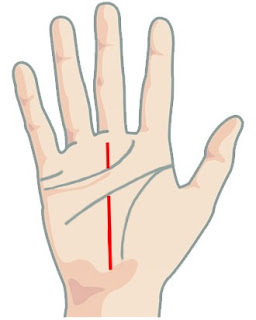 In China, people would like to call the line as the career line as it mainly reflects the fortune of one's career or job. 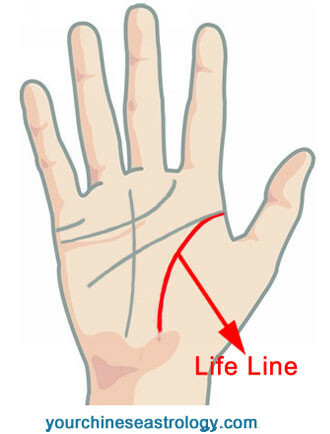 From the line, you can find out the changes of your career during your life as well as your ability in work. If your fate line is clear, deep and straight without too much crosses, you are regarded to be bestowed with a good fortune in career. 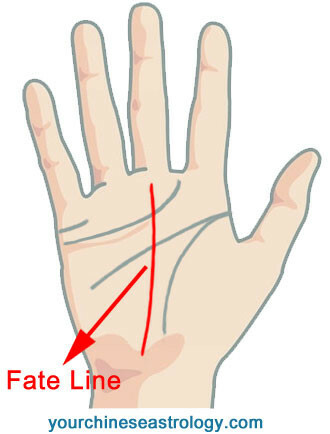 Please find out the timing on the fate line from the picture at the right. The line is marked from the base of the palm with the age of 5. 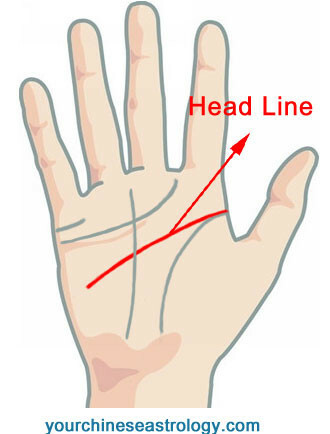 The intersection point of the fate line and head line is for the age of 35 and the point with the heart line is for the age of 55. 75 years old is located at the Mount of Saturn. After knowing the timing of the fate line, you could easily find out the fortune for your career and destiny at different ages. 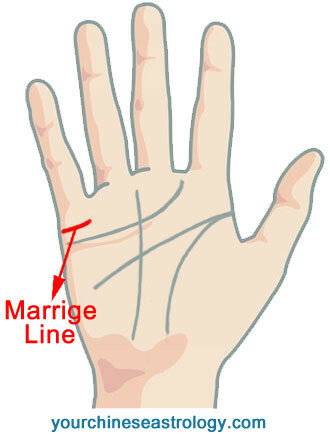 Absent of fate line doesn't mean you don't have career during the life. It indicates you always change your job and don’t have a permanent occupation in your life. This may be caused by your careless character. Or you couldn’t find a job that you are interested in. Dots and chains: for these on your fate line means that you will experience worry at work. 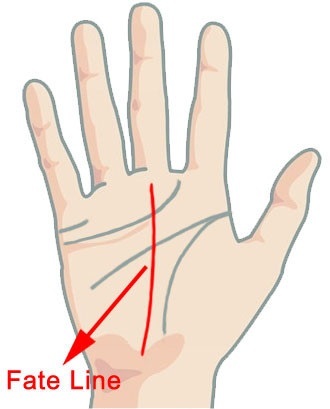 The actual point should be noted. It is important to recognise that there may be a surprise event if you notice a single dot on this line. Triangles: the career that you choose will be associated with psychic pursuits, such as a clairvoyant. A triangular is not a bad sign or this indicates that you will strive to obtain things in your life. Squares: the square on the hand generally appears on natural teachers. These people have the talent to motivate other people. Crosses: a cross that appears on the fate line shows you will have to overcome obstacles or blockages that will hold you back from achieving your main goals in life. This is a barrier to your true destiny. Tassels: not typically seen on the hand; can represent scattered energies or un-manifested ideas. 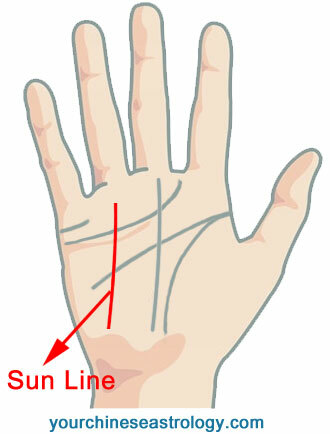 Grilles: represent lots of starting and stopping with respect to life's endeavours. Stars: to have a star on your fate line means you will be famous. Circle on the fate line: a circle is a great sign on the mounts, as this suggests success at work, if found on the line marking out the circle then it foretells trouble. A shallow fate line indicates a hard work and career full of twists and turns. 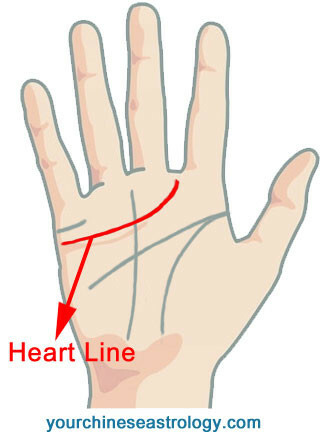 If you find the fate line ends at the heart line, it means your career is affected by your emotion. 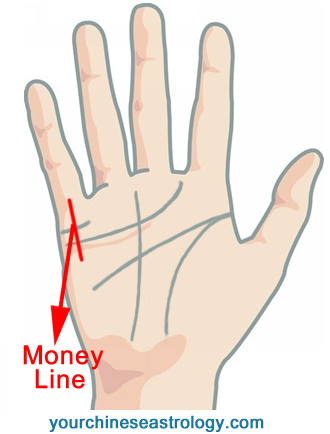 You usually let your emotions interfere with career or rule business decisions. It also indicates a career decline from the age of 50.